In the 1950s the Princess Maud and Hibernia were two of the ferries which plied their way between Holyhead and Dun Laoghaire. I travelled on them several times as a youngster when my mother took me back to Mayo to see her people. Memories of long, exhausting, journeys recently came flooding back as I read through a cache of endearing letters, sent almost daily by my mother to my father over the weeks while we were away. Family letters are a wonderful, precious, social record. Who, I wonder, will bother to keep their e-mails? During those long ago expeditions to Ireland, my mother’s heart always fell when our steam train arrived in North Wales or, when we arrived back in Dublin, if she saw that our return journey across the Irish Sea was to be on the Maud. That particular vessel was notorious. It had no stabilisers and on a rough winter night we were always in for a roller coaster of a ride. Endless sea sickness is my abiding memory of those Irish Sea passages. Some passengers simply refused to travel on the Maud, waiting instead for the comparative comfort of the Hibernia or the Cambria. Yet, all this said, the Maud had a brave and distinguished career. Built in 1939, she was reputed to have been the last ship to have left Dunkirk – carrying thousands of troops to safety – and she was there at the Normandy Landings. After the hostilities, and until 1965, she earned her keep as an Irish ferry; then, after a refit and service in Greece, the old lady was finally taken to Spain and broken up for scrap. Back in the fifties passengers on the Princess Maud would disembark at Dublin’s port of Dun Laoghaire. From there my mother and I would commence a meandering train ride across Ireland, memorably marked by crossing the Shannon and finally arriving in the West at Mayo’s town of Castlebar. Invariably, my mother’s youngest brother would be there to collect and drive us by horse and trap to endless relatives and childhood friends of my mother. In the remote villages around Lough Mask, where she grew up, and in the parish of Tourmakeady, everyone seemed to be related to my mother – or so it seemed to a young child. I would be dutifully presented, inspected, and admired and always plied with hard boiled sweets or a penny for my pocket. Other sharp memories of those visits are of good food and clean air – a stark contrast to 1950s rationing, East End smog, and the rattle of London trolley buses. But this different universe also provoked endless questions in the mind of a young boy. Whose were the abandoned tumbledown cottages which pock marked the verdant countryside? What had happened to the people who had lived here? Why had they had to go to America or England? Who had lived in the “big house”, Moore Hall, burnt out in 1923 during the Civil War and whose ruins of made such an extraordinary playground for young children? Endless questions. Many of the answers were ambiguous or circumspect and, anyway, this was an Irish speaking area – my mother’s first language – so it wasn’t difficult to prevent a little boy from eavesdropping. This was, after all, a community which little more than thirty years before had fought its way to independence from the Crown. And the family situation wasn’t altogether easy. My mother and her younger sister had married across the religious divide. My uncle was an Orangeman; my father C.of E, and a Cockney. In addition to contending with the sectarianism which this engendered they also had to cope with considerable poverty and hardship. Their story was characteristic of the times. After the too early death of her own parents, my mother, along with seven of her brothers and sisters, had left Ireland, each working to support themselves and leaving only the youngest behind. In a London still recovering from the Blitz my mother and father met. As a teenager, along with his four brothers dad had enlisted to fight the Nazis – it cost one brother his life. My father was a Desert Rat and survived El Alemain, the Italian landings and Monte Casino. But the British Army was not something to talk about where my mother grew up. Not far from where her parents’ cottage had stood there had been a small fortified position which had housed Black and Tans – for the uninitiated these were the criminals and cutlasses recruited by Lloyd George into the Royal Irish Constabulary (RIC) to quell the Irish uprising. In the summer of 1920 the Black and Tans burnt and ransacked a succession of Irish towns including Tuam and Thurles and among those they killed was the Galway priest Fr.Michael Griffin, whom they abducted and murdered. In the 1950s these events were still within the raw memories and the folk law of people alive in the West of Ireland. The depredations of the Black and Tans are well documented. Their name was synonymous with cruelty and became a pejorative term of abuse. Another word which owes its origins to that part of the world is the term ‘boycott’. It also has its origins in cruelty. In 1880 Captain Charles Boycott had come to work the lands around Lough Mask owned by the British Peer, the third Lord Erne (John Crichton). 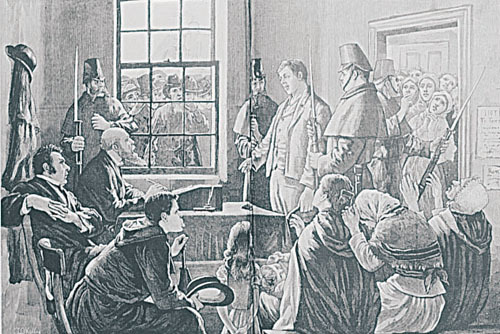 On his behalf, Captain Boycott tried to thwart the Irish Land League’s campaign for fair rents and security of tenure – preferring instead to victimise and evict impoverished tenants. Stories abound of families evicted in the depths of winter from their hovels and simply left to starve. The local community eventually fought back by ostracizing Boycott and they withdrew their labour – leading to 50 Ulstermen, protected by 1,000 men from the RIC, coming down from the North to bring in the harvest. It cost the Crown £10,000 to dig out £350 worth of potatoes. The use of boycotts would in due course cost them a great deal more. Boycotts, evictions, and the Black and Tans were just some of the stories which I heard as a boy. But there was one event which I could never get anyone to tell me about. It was the macabre story of the Maamtrasna Murders – the shocking deaths of five members of the Joyce family – all done to death on the 18th of August 1882 in their tiny cottage – close to the little school where my mother and her parents had received an elementary education. More than a century later the case was carefully re-opened and documented by a Mayo priest, Fr.Jarlath Waldron. He records the deeply distressing story of a man hanged for a crime he did not commit. The story left me wondering whether, even with this passage of time, shouldn’t an innocent man’s name be cleared and an old injustice put right? 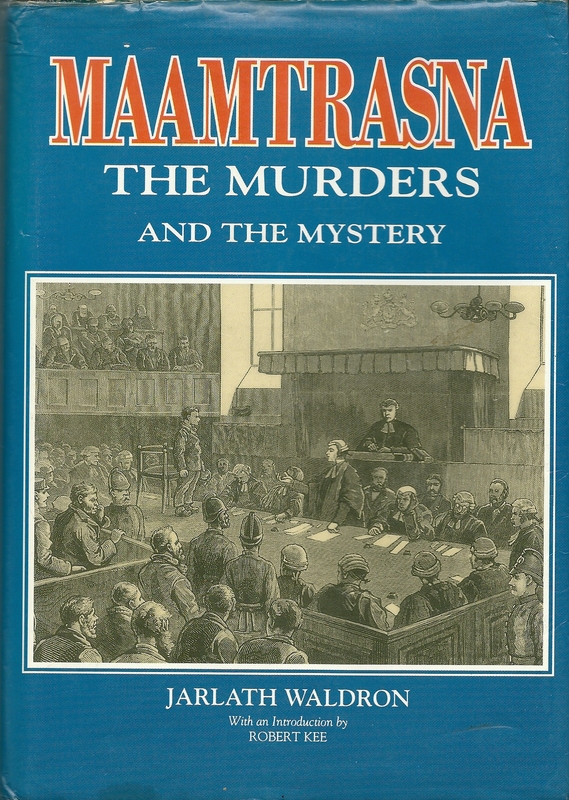 Next… David Alton tells the story of the Maamtrasna Murders and the wrongful execution of an innocent man.